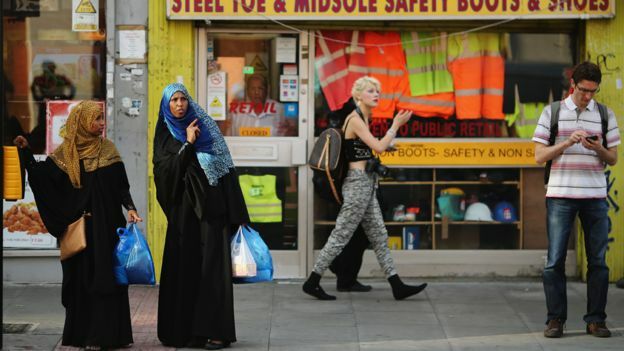 This year has seen a spike in anti-Muslim hate crimes, and a new survey shows women are suffering the most - so what's it like to be a black British Muslim woman at the moment? Not great, says Muna Ahmed. A man mimed shooting Linda with a rifle as he crossed the road. A man spent an entire train journey staring aggressively at Sonya, his face inches from hers. These are the kind of incidents Muslim women face every day. One young woman told me she has stopped listening to music so she can hear if someone is following her. Another has considered taking off her headscarf because she doesn't feel safe. Many women worry about being attacked or singled out because of their faith. Most have experienced verbal abuse. They worry about being out after dark, and drive with their windows closed. "The thought of being attacked crosses my mind now more than ever," says Natasha, a Muslim convert from Sheffield. "I've always felt safe here in England, but post-Brexit, post the [terror] attacks, it's getting worse and worse." It wasn't always like this. Growing up in Sheffield, I was just like every other kid I played with - I may have been a tad cheekier, but nobody treated me differently because of my race or faith. At the weekends I would see people pouring out of the church and the mosque at either end of our street. I don't remember any hostility and I certainly didn't see any conflict between the faiths. It was just normal. Everybody on my road knew each other. My friends Gemma and Tracy lived at the top of my street and we would walk to school together every day. When we got home we would eat fish-fingers and go straight out to play. Weekends were the best because we would get up early to watch cartoons and mum would make us pancakes. I enjoyed all the religious holidays because there were always treats involved. At Easter we would get chocolate eggs. During Ramadan we tried to fast so we could take part in the evening feast, but Mum knew that we would be starving by 4pm so she would leave a plate of food out, which my friends and I would sneak into the house and eat. I loved the Christmas holidays because I would go and visit my grandmother and she would spoil me rotten. And on Eid I would get whatever I wanted. Thinking about it now, I had the best of both worlds. But 9/11 changed everything. I went from being a carefree teenager who had never been asked about my religion to having people constantly ask me questions about Islam - questions that I didn't have the answers to. I asked my parents about al-Qaeda, and where Islam stood on terrorism. Every day I would come home with a different question, because the Islam that had become "the enemy" was not the religion I knew. Ever since then, my country has not been a positive place to be a Muslim woman - and it seems to be getting worse. The other day I saw a big crowd of people listening to a man with a megaphone shouting: "We need to get these Muslims out of our country, we need to stand united against Islam." A lot of people seemed to be agreeing with him. A few days after that I posted a video on Facebook about how the tabloids portray Muslims and the first person to comment was one of my childhood friends, a girl I used to play with all the time. She reeled off a list of radical preachers - as if they represent Islam. The conversation went on for a while, while I tried to educate her about Islam. But she was having none of it. At one point she said: "You're welcome in this country but your religion isn't." It got worse - the final thing she said to me was: "Muna, you have blood on your hands too." I felt physically sick when I saw those words on my screen. But Muslim women often experience abuse on social media these days. Sonya is a 23-year-old British Asian Muslim. We sat and talked about our experiences, laughing at the silly assumptions people have about Islam - for example, that she'll have to have an arranged marriage. But it was less funny when she told me about the death threats she had received on social media. "I was quite popular on Twitter, I used to put up information about Islam and things like that. But all of a sudden dozens of people started commenting and saying all sorts of horrible things, like: 'Go back to your country,' 'We're going to come and kill you,' 'We will hunt you down,' 'You are disgusting to look at.'" I don't have any children but whenever I'm back home in Sheffield I always take my two nieces, 10-year-old Aaliyah and seven-year-old Amanie, out for ice cream. As we approached the restaurant last time we heard police sirens - they had been called to the scene because a white man was yelling obscene Islamophobic language at two Muslim waitresses. I grabbed my two nieces and told them we'd come back later. As we walked off, Amanie looked at me and said: "Why is that man saying bad things about Muslims?" How do you tell a seven-year-old that some people in this country will treat you unfairly because of your race and religion? The first time I wore a headscarf to work, a woman who works in our building said I like looked like a North African kidnapper, in front of my entire team. I laughed it off, but I felt isolated and different from everyone in the room at that moment. It's like people don't know how to react to us any more - why are people so anxious around Muslim women? We're not creatures from outer space, we're just women, and some of us choose to cover our hair. Why is it such a big deal? Saadiya is a young British Asian woman who works in the City. Like me, the only time she wears a headscarf is when she is going to the mosque - but on those occasions she gets weird looks - looks I know all too well. "When our family moved to this country they faced a lot of that, and it was a real struggle for them," Saadiya tells me. That was 30, 40, 50 years ago - we've come a long way since then, and yet it feels as if we are now going 10 steps back. Even though I have a thick Yorkshire accent, I'm often made to feel like I don't belong. One minute I'm fighting off racists and then a second later I'm back in the ring defending my faith. It feels like I'm constantly justifying my own existence. We are at risk of terror attacks like everybody else, but we also have to deal with the backlash. After major attacks we have to endure intimidating comments and fear personal attacks, all because of the actions of a terrorist. Being held accountable for the actions of extremists is a massive burden. Some days I want to scream at the top of my voice that I have nothing to do with terrorism but it doesn't matter how loud I scream, I will always be tarred with the same brush. All we want is to feel safe in our own country and to be accepted for who we are - because we are British and this is our home.